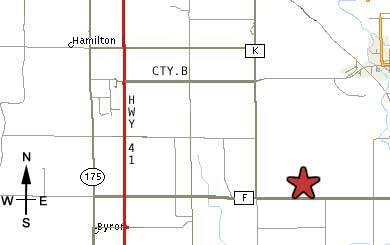 Coming from the north, take Highway 41 south to County Rd B, take a left (east) onto County B. Go to County Rd. K, take a right (south) onto County K and to County Rd F. Take a left (east) onto County F. Lightning Repairs is the third house on the left hand side of the road. The business is next to a white house with black shutters. If you come to a road named Hilltop Rd, you went to far. Coming from the south, take Highway 41 north to County Rd. B, take a right (east) onto County B. Go to County Rd. K, take a right (south) onto County K and to County Rd. F. Take a left (east) onto County F. Lightning Repairs is the third house on the left (north) side of the road. If you come to a road named Hilltop Rd., you went to far. If you have any questions on directions, call Paul at 920.477.6655.